Other than a painful tech edit right before the second verse, the song passes with flying colors while falling in line with Journey’s bombastic arena rock. There’s an AC gloss and classic rock glow to it, which is sort of expected considering today’s technical processes and Perry’s signature songwriting. And after being recently inducted into the Rock and Roll Hall of Fame, Perry — the legend — is actually in pretty good shape vocally. When you have been gifted with one of the greatest voices in music history, ranking at #76 on Rolling Stone’s 100 Greatest Singers of All time list, making a comeback shouldn’t be that hard. 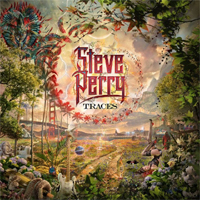 Traces drops October 5 on Fantasy Records.